HomeEmergency PreparednessHave you seen the news recently? I’m worried. Is it just me, or does it seem like things are going downhill on a greasy slide? If you’re anything like me, this has spurred your prepping endeavors on with a renewed sense of urgency. The very fastest way to increase your food supply is so simple you won’t believe it. Emergency buckets. Rated to sit on your shelves untouched for up to 30 years, filling your long-term stockpile with buckets is the best way to see your family through all manner of disasters. Each bucket contains a generous one-month supply of delicious food for one person. You can figure out exactly how much you need to feed your entire family for a given period of time. For those with special diets, gluten-free buckets are also available. 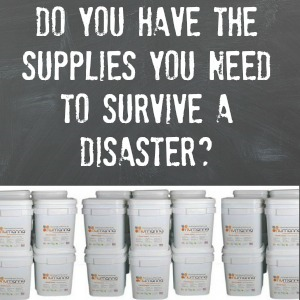 Visit Prepper’s Market today and be sure that your family is nourished, not just fed, in an emergency. 4 Comments on Have you seen the news recently? I’m worried. Succinct and to the point. I have been storing these types of buckets for several years with a variety of food stocks. I also recommend supplementing them with regular canned good items you like; spam, soups, chili etc. Even though the “sell by dates” are usually two years this does not mean they are no longer good to eat. when I was in the military in the 80’s they were issuing us C-rations (canned goods) made during the Korean War (50-53) and they were still edible. As long as they are not frozen or subjected to heat they remain good for a long time. Hi Sgt Bill, Good to know those C-rations last a long time! Thanks for the comment. Waking up to the news of an attempted military coup in Turkey got me thinking about prepping, but as with most things, it’s knowing where to start! Great recommendation for the Emergency buckets: I did’t know they existed, but they look like a great starting point! Hi Ryan, Glad you are interested in getting started. Thanks for the comment.